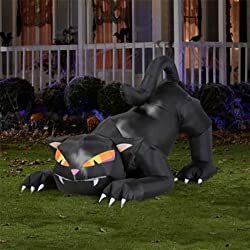 Set the mood with an inflatable animated cat! Several sizes and styles to choose from. 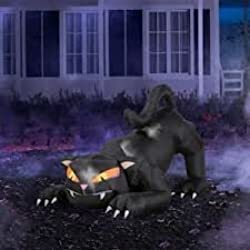 Everyone knows inflatable animated cats are great for Halloween decorations, but they’re popular all throughout the year too: They’re great decorations for parties, and make great attention-getters for yard sales or other events. For more information about inflatable cats please scroll down beneath the inflatables for sale. How does it inflate? 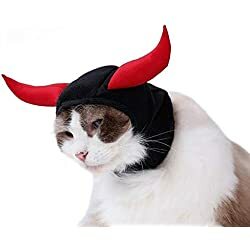 Most “inflatable” cats are actually air blown: An electric blower blows air into the cat which inflates it, then it stays inflated as long as the blower keeps blowing. In other words, most inflatables of this type aren’t like a balloon or air mattress that you blow air into then put in a plug to hold the air inside. However, there can be exceptions. 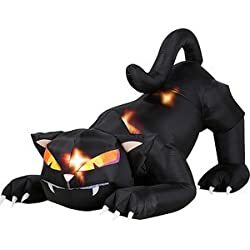 So, when shopping for an inflatable cat, and even though it may sound silly, make sure you know whether it’s an air blown inflatable or a different type. 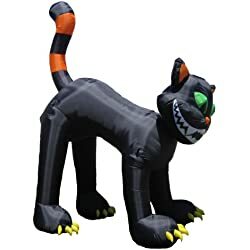 Where is the inflatable cat animated? On many of them it’s the head that moves, but that’s not a given. Find out for sure so you’re not surprised after it arrives. How big is it? Inflatable cats vary in size, and it’s often difficult to get a proper perspective just from looking at photos to tell you how big it is. 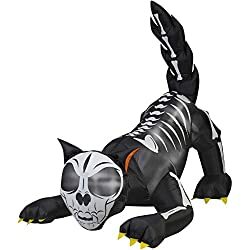 Many inflatable cats are described as “giant” or something similar, but make sure you know how big it is (or isn’t) in actual feet or inches. 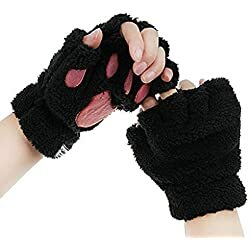 Is it furry? Do you care? Some inflatables cats are furry or plush, but others are slick. If it makes a difference to you, make sure you read the description to find out. Does any part of it light up? If there are lights, are they internal or external, and what part(s) light up? What does – or does not – come with the inflatable cat? For example, does it come with a blower, yard stakes and/or tethers? Don’t assume what you will be getting: Some inflatables come with accessories but others don’t. If a blower comes with the cat, what powers the blower? Usually it’s electricity, so it might be helpful to know how long of an electrical cord is included. Don’t be surprised if you will need to add your own extension cord. 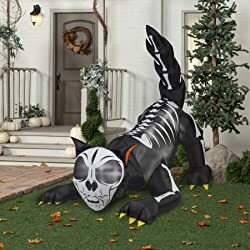 Is the inflatable cat rated for indoor use, outdoor use, or both?